We’re committed to protecting user privacy and providing a safe and secure environment for our users. Apps that are deceptive, malicious, or intended to abuse or misuse any network, device, or personal data are strictly prohibited. You must be transparent in how you handle user data (e.g., information collected from or about a user, including device information). That means disclosing the collection, use, and sharing of the data, and limiting the use of the data to the purposes disclosed, and the consent provided by the user. In addition, if your app handles personal or sensitive user data, please also refer to the additional requirements in the "Personal and Sensitive Information" section below. These Google Play requirements are in addition to any requirements prescribed by applicable privacy or data protection laws. Limit your collection and use of this data to purposes directly related to providing and improving the features of the app (e.g. user anticipated functionality that is documented and promoted in the app's description). Cannot be included with other disclosures unrelated to personal or sensitive data collection. Must not utilize auto-dismissing or expiring messages. In addition to the requirements above, the table below describes requirements for specific activities. Your app handles financial or payment information or government identification numbers Your app must never publicly disclose any personal or sensitive user data related to financial or payment activities or any government identification numbers. Your app handles non-public phonebook or contact information We don't allow unauthorized publishing or disclosure of people's non-public contacts. provide the same level of protection as is required by the Privacy Shield Principles. You must monitor your compliance with these conditions on a regular basis. If, at any time, you cannot meet these conditions (or if there is a significant risk that you will not be able to meet them), you must immediately notify us by email to data-protection-office@google.com and immediately either stop processing EU Personal Information or take reasonable and appropriate steps to restore an adequate level of protection. Permission requests should make sense to users. You may only request permissions that are necessary to implement critical current features or services in your application. You may not use permissions that give access to user or device data for undisclosed, unimplemented, or disallowed features or purposes. Request permissions access to data in context (via incremental auth), so that users understand why you need the permission or data. Use the data only for purposes that the user has consented to. If you later wish to use the data for other purposes, you must ask users and make sure they affirmatively agree to the additional uses. Your app manifest requests the Call Log permission group (e.g. READ_CALL_LOG, WRITE_CALL_LOG, PROCESS_OUTGOING_CALLS) It must be actively registered as the default Phone or Assistant handler on the device. Your app manifest requests the SMS permission group (e.g. READ_SMS, SEND_SMS, WRITE_SMS, RECEIVE_SMS, RECEIVE_WAP_PUSH, RECEIVE_MMS) It must be actively registered as the default SMS or Assistant handler on the device. Apps lacking default SMS, Phone, or Assistant handler capability may not declare use of the above permissions in the manifest. This includes placeholder text in the manifest. Apps must be actively registered as the default SMS, Phone, or Assistant handler before prompting users to accept any of the above permissions and must immediately stop the use of the permission when it's no longer the default handler. Apps may only use the permission (and any data derived from the permission) to provide approved critical core app functionality (e.g. critical current features of the app that are documented and promoted in the app's description). You may never sell this data. The transfer, sharing, or licensed use of this data must only be for providing critical core features or services within the app, and its use may not be extended for any other purpose (e.g. improving other apps or services, advertising, or marketing purposes). You may not use alternative methods (including other permissions, APIs, or third-party sources) to derive data attributed to the above permissions. The objective of the above restrictions is to protect user privacy. We may grant limited exceptions to the default handler requirement in cases when an app is not the default handler, but abides by all of the above requirements and clearly and transparently provides a highly compelling or critical feature where there is currently no alternative method to provide the feature. Such features will be evaluated against any potential privacy or security impact on users. These exceptions are rare and will not be extended to all developers. Please see this Help Center page for more information. We don’t allow apps that interfere with, disrupt, damage, or access in an unauthorized manner the user’s device, other devices or computers, servers, networks, application programming interfaces (APIs), or services, including but not limited to other apps on the device, any Google service, or an authorized carrier’s network. Apps on Google Play must comply with the default Android system optimization requirements documented in the Core App Quality guidelines for Google Play. Apps that block or interfere with another app displaying ads. Game cheating apps that affect the gameplay of other apps. Apps that facilitate or provide instructions on how to hack services, software or hardware, or circumvent security protections. Apps that access or use a service or API in a manner that violates its terms of service. Apps that attempt to bypass system power management that are not eligible for whitelisting. We don't allow apps that steal data, secretly monitor or harm users, or are otherwise malicious. Surveillance and Commercial Spyware apps are explicitly prohibited on Google Play. Only policy compliant apps exclusively designed and marketed for parental (including family) monitoring or enterprise management may distribute on the Store with tracking and reporting features, provided they fully comply with the requirements described below. Apps that link to or facilitate the distribution or installation of malicious software. Apps that introduce or exploit security vulnerabilities. Apps that steal a user's authentication information (such as usernames or passwords) or that mimic other apps or websites to trick users into disclosing personal or authentication information. Apps may not depict unverified or real world phone numbers, contacts, addresses, or personally identifiable information of non-consenting individuals or entities. Apps that install other apps on a device without the user's prior consent. Apps designed to secretly collect device usage, such as commercial spyware apps. Apps must not hide or cloak tracking behavior or attempt to mislead users about such functionality. You are solely responsible for determining the legality of your app in its targeted locale. Apps determined to be unlawful in locations where they are published will be removed. Check out our App Security Improvement Program to find out about the most recent security issues flagged to developers on Google Play. Vulnerability and remediation details are available in each campaign's support page link. We don't allow apps that attempt to deceive users or enable dishonest behavior. Apps must provide accurate disclosure of their functionality and should perform as reasonably expected by the user. Apps must not attempt to mimic functionality or warnings from the operating system or other apps. Any changes to device settings must be made with the user's knowledge and consent and be easily reversible by the user. We don’t allow apps that contain false or misleading information or claims, including in the description, title, icon, and screenshots. An app that claims to be a racing game in its description and screenshots, but is actually a puzzle block game using a picture of a car. 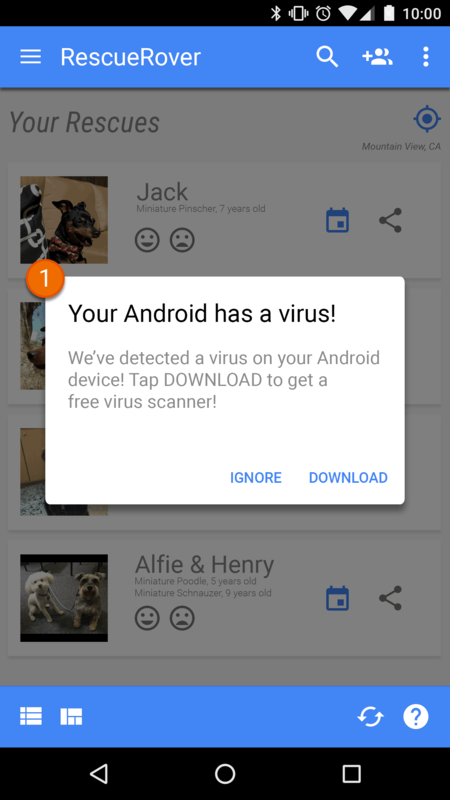 An app that claims to be an antivirus app, but only contains a text guide explaining how to remove viruses. Developer or app names that misrepresent their current status or performance on Play. (E.g. “Editor’s Choice,” “Number 1 App,” “Top Paid”). Apps that feature medical or health-related functionalities that are misleading or potentially harmful. Apps that claim functionalities that are not possible to implement. Apps that are improperly categorized. We don’t allow apps or ads that mimic or interfere with system functionality, such as notifications or warnings. System level notifications may only be used for an app’s integral features, such as an airline app that notifies users of special deals, or a game that notifies users of in-game promotions. ① The system notification shown in this app is being used to serve an ad. For additional examples involving ads, please refer to the Ads policy. We don’t allow apps that make changes to the user’s device settings or features outside of the app without the user’s knowledge and consent. Device settings and features include system and browser settings, bookmarks, shortcuts, icons, widgets, and the presentation of apps on the homescreen. Apps that modify device settings or features with the user’s consent but do so in a way that is not easily reversible. Apps or ads that modify device settings or features as a service to third parties or for advertising purposes. Apps that mislead users into removing or disabling third-party apps or modifying device settings or features. Apps that encourage or incentivize users into removing or disabling third-party apps or modifying device settings or features unless it is part of a verifiable security service. We don't allow apps that help users to mislead others, including, but not limited to, apps that generate or facilitate the generation of ID cards, social security numbers, passports, diplomas, credit cards and driver's licenses. Any claim that an app is a "prank", "for entertainment purposes" (or other synonym) does not exempt an app from application of our policies. We do not allow apps or developer accounts that impersonate any person or organization, or that misrepresent or conceal their ownership or primary purpose. We do not allow apps or developer accounts that engage in coordinated activity to mislead users. This includes, but isn’t limited to, apps or developer accounts that misrepresent or conceal their country of origin and that direct content at users in another country.